What life do we choose? 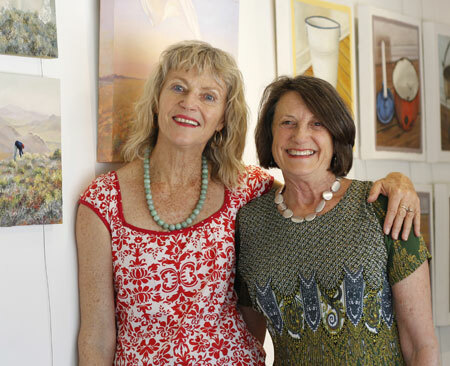 Two former Central Australian residents, Cait Wait and Kerrie Nelson, have come back to show a collaborative art and poetry exhibition as a homage to their homeground of 20 years ago. Their three-decade friendship was formed here and both have returned to work and visit since that time. Appropriately, a grant from Heritage Alice Springs helped make their modest but celebratory collaboration a possibility. It opened at The Residency last Friday night, as did Noel Ferry’s photographic exhibition, ‘What is Given Back’. Both will run until 30 November. Cait and Kerrie (at right, photo by Aksana Hugo Anastas) have an art and poetry workshop planned for this Saturday, 24 October, exploring ekphratic responses to a loved object or work of art. Put simply ekphrasis is one art form informing another. Contact Tara Leckey at The Residency to enrol. 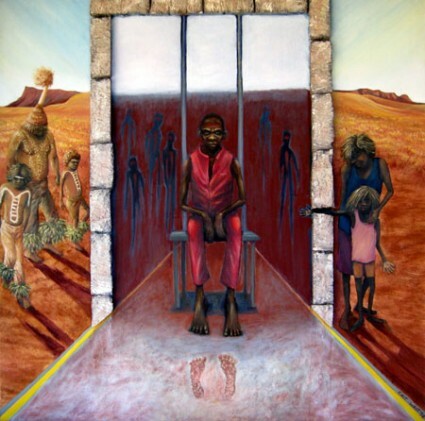 CRAIG SAN ROQUE‘s opening speech, which we publish below, calls on all of us to nurture whatever creative spirit is moved by the country we live in here in Central Australia and celebrates the artistic and poetic responses in A Chosen Life. (From Ovid’s opening lines to his ‘Metamorphoses’). As I recall it some of the most distinctive projects in this place, Alice Springs, first began spinning in playgroups, at ‘mothers’ clubs’, around kitchens and in the yards of houses backing onto lanes that give access to the flow and spin of neighbourhood. Kerrie will recall, from the old photographs she has tonight in her handbag, memories from when she too once was a mother in local backyards (back in the 1990s). Teapot talk while babies babble. This kitchen gathering line continues right up to the present time – teapot talk in community yards in town and out bush become the first Afghan Traders, the first Beanie Festival, the first Pioneer Women’s Hall of Fame, the first Keringke Arts and right here now in this Residency kitchen – Mel Darr’s family bakery. Kerrie Nelson’s paid work was in Indigenous affairs and governance. And there she has contributed in ways often hidden from public view, wrapped up like a caterpillar in the root systems of bureaucracy – that nest of Babel that attempts to govern the ungovernable with a language indecipherable – except that Kerrie worked hard to make the language of governance clear and manageable. And then Kerrie’s language turned to the matter of beauty. And it is here, in Alice Springs, that she met Miss Wait – observations of light, clarity of vision, precision of line, memory. Cait Wait’s connection with these women and one of the sons seen here in prison for the first time, woven in long threads through endless mornings and tea serving the conception of the Indigenous art movement… Santa Teresa, the Wallace and Abbott families… the silk paintings, the mural transformations of time and place – Jerusalem, Golgotha – soaked into the luminous fabric of Santa Teresa church. I remember Cait, after all that arduous, selfless service, seeking respite in the studio of the Waterford/ Dutton yard, choosing, as she had to choose, a new life for her own artistry, her own imagination. These two women – roughened and sharp like rusted buckets – like a mirror in the mirror of each other. Da Vinci texture recalled by Cait, Florence, Rome, Pompeii, Dante’s metred line and vision remembered by Kerrie – Florence, Kintore, Alekarenge, Valley of the Winds, Willowra, windblown yards, kitchens, playgroups, where children first learn their language – those women and those sites are a part of the unbroken thread that comes down through us. Why do we choose the life we make, how do we choose the people? 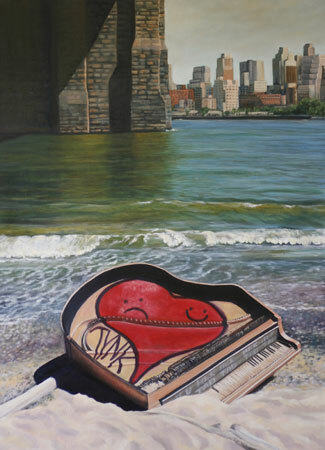 God alone knows but here we are together in this quiet, this modest showing, and behind it there hovers homage to experience of two great cultures, the European and the Indigenous and where they end up – perhaps abandoned and broken – like a grand piano under the Brooklyn Bridge (at left, photo by Aksana Hugo Anastas). It is essential that we who live here continue to think and write and paint in a manner attuned to a poetic sense as this is a most poetic country. 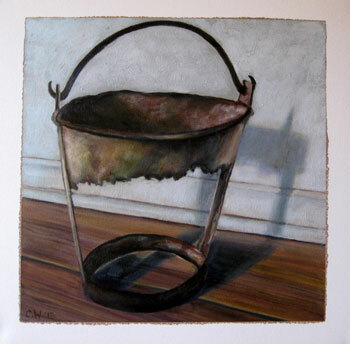 This poem of Kerrie’s goes with Cait’s painting of the rust bucket. It is in the voice of her mum, Eth. On which I was born – the Central West slopes and plains. on my own devices. They have hidden the keys to my car . . .
at home in my eighty-sixth year, I am still my own woman. I am cashed up, dressed up, my pink lipstick is on straight. With luck I will walk upright to my grave. Who do not recall learning their independence from me. Note: Kerrie performed several of her poems on opening night. Her awards include Overland’s Judith Wright Poetry Prize for New and Emerging Poets (2010) and the NT Writers Centre Poetry Prize (2014). She has been published in the Canberra Times and a recent anthology of Canberra poets.